Are you responsible for improving the thermal transport properties of thermal insulation? Are you working in QA of insualtion materials and you collect thermal conductivity data all day long for CE-compliance? Are you working in R&D of polymers? Are you working for a certified laboratory or building material institute – and are you dealing with different kinds of materials? Are you dealing with one kind of material all day long? Are you dealing with thermal conductivity for specifiying the specsheet of your material? Then maybe the measurement range of a heat flow meter is very important for you? The question remains, although heat flow meters are used in various applications, is it the appropriate technique for measuring the thermal conductivity of any material or product? The answer to this question is straightforward: The measurement range of heat flow meters is not defined in “thermal conductivity,” but in “thermal resistance”! The ISO 8301 standard for heat flow meter technique clearly states the thermal resistance ranges that can be measured. Moreover, it is very easy to perceive. A stable heat flow, which is the most important for a heat flow meter result, can be achieved by forming a specific kind of thermal resistance to maintain a temperature gradient between the hot and the cold plate. This is the main reason for the usage of heat flow meters for insulating materials. The table below presents an example calculation based on glass wool that has a thermal conductivity of 0.035 W/m/K. It is evident that not all glass wool samples are appropriate for carrying out a proper measurement. Thermal resistances of glass wool in different thicknesses. Heat flow meter measurement range is defined by thermal resistance. What Can be Done if a Sample has a Lower Thermal Resistance than 0.5 (m2K)/W? The purported “blind specimen method” can be used, which involves placing an “unknown” sample to be measured between two samples of known thermal resistance. The thermal resistance of the “unknown” sample can be calculated from the total thermal resistance minus the thermal resistance of the known samples. 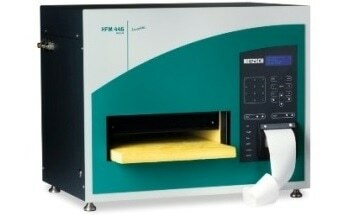 The thermal conductivity of the sample can be calculated by knowing its thickness. Heat flow meters are ideal instruments for measuring the thermal conductivity of a broad range of materials. In case researchers are not sure whether a heat flow meter can be used to measure the samples, it would be best to determine the thermal resistance of the samples.